One of the largest expenses in maintaining any facility is in the operation of energy-consuming systems. Heating, ventilating, and air conditioning (HVAC), interior and exterior lighting, domestic water heating, and receptacle loads each have limited useful life. Everything ages: People, automobiles, and even buildings. People need check-ups to stay healthy. Automobiles need maintenance to run efficiently. 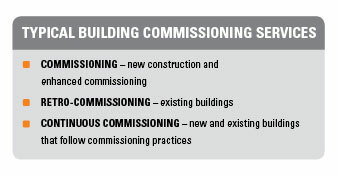 Buildings need improvements to function economically. As structures and equipment age and the building functions change over time, the efficiency of those systems generally degrade. This results in decreased air movement and comfort, diminished standard lighting levels and quality, and increased energy costs. Through Retro-Commissioning (RCx), Terracon assesses and develops plans to enhance the operation of energy consuming systems for existing buildings that have previously not been commissioned. The results are improved efficiency, and ultimately resulting in lower operating costs for our clients. Terracon serves as a valuable partner to facility owners in developing solutions and strategies to enhance and increase building performance as well as implement those solutions. Over the last 20 plus years, Terracon engineers have encountered a variety of issues challenging clients. These include increased energy costs, errant temperature and relative humidity control, inadequate ventilation, and changes in building usage. Our engineering team has developed methods to solve many of these challenges through the five phases of retro-commissioning (pre-screening, planning, investigation, implementation, and verification). Methods involve in depth assessment, diagnostics, remedial design, troubleshooting, and problem solving. The investment of a building owner or facility manager’s time and money is minimal in comparison to the wide range of RCx benefits. A thorough assessment of a building’s processes and systems leads to establishing energy saving measures that are low-cost and make realization of return on investment short, extend equipment life, reduce operation & maintenance costs, and improve occupant comfort and indoor environmental quality. Facilities with a large amount of square footage, and/or energy consumption generally benefit the most from RCx. They also typically contain a building automation system and existing equipment in fair to good condition. The more complicated the systems, the better the opportunity to benefit from retro-commissioning. Schools and data centers are excellent candidates for RCx. There are many different ways we have found savings for our clients. Terracon facility consultants developed a plan to re-program the existing HVAC controls and building automation system at a 540,000 square foot aging major suburban high school. One particular energy conservation measure identified in the plan was to improve the utilization of the existing chilled water thermal storage system. 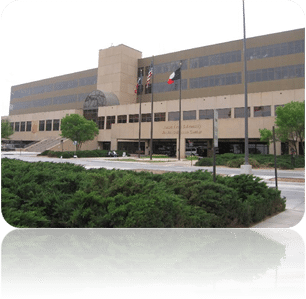 The thermal storage system contained a 1,000,000-gallon steel storage tank that was designed and installed to store chilled water for cooling in the HVAC systems for use during peak electric consumption periods in lieu of operating water chillers. Terracon determined through an investigation of the electric utility rates that the operating schedule of the thermal storage system could be altered such that the facility could utilize thermal storage for cooling to reduce electrical utility demands in lieu of operating an 800-ton water chiller during peak cooling periods. Terracon provided RCx services for a data center housing two specialized HVAC units with two controllers. Both units set for 64 degrees farenheit and 50 percent relative humidity. Terracon found the two controllers, both communicating with the building automation system, were “battling” each other. One would be heating and the other cooling. One would dehumidifying while the other was humidifying. The solution? Program the system to automatically lock out dehumidifying/humidifying if the humidity level was within an acceptable tolerance. In some cases, the upfront investment is minimal or nonexistent and Terracon is able to provide a way for the client to see immediate payback. In each of the following examples, the concepts were used throughout the school district. 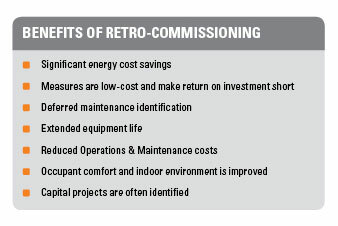 Retro-commissioning should not be looked at as a one-time event, but rather the first step in the process that keeps a building in tune, and functioning at its most efficient. This is achieved with ongoing monitoring of utility consumption, using tools that detect significant changes, conducting periodic check-ups to detect previous energy conservation measures degradation, and identifying new RCx opportunities. Terracon facilities services professionals are skilled in bringing the right blend of engineering disciplines together to provide integrated solutions to improve building energy and operating performance yielding a potential substantial energy cost savings to your bottom line.